Categories: We are experts in drilling 4 ½" and 6 ½" dia borewells with super fast hydraulic rigs and experienced borewell drilling operators. About Us: This firm is run by well experienced people for Borewells in Hyderabad, we are having 4.5 capacity to drill upto 1500 ft depth for Borewells and 6.5 capacity to drill upto 1800 ft depth for Borewells. 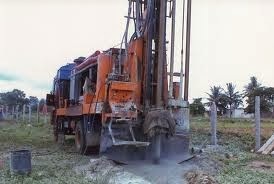 Some times we need to drill upto 1800 feet depth to get the water in Hyderabad and surroundings. Categories: We have experts in drilling 4 ½" and 6 ½" dia borewells with super fast hydraulic rigs and experienced borewell drilling operators. About Us: This Borewell firm is run by well experienced people for Borewells in Hyderabad, we are having 4.5 capacity to drill upto 1500 ft depth for Borewells and 6.5 capacity to drill upto 1800 ft depth for Borewells. Categories: We have expert persons in drilling 4 ½" and 6 ½" dia borewells with super fast hydraulic rigs and experienced borewell drilling operators. About Us: We are experts in drilling 4 ½" and 5 ½" dia borewells with super fast hydraulic rigs and experienced borewell drilling operators. Venkat. Watermark theme. Powered by Blogger.